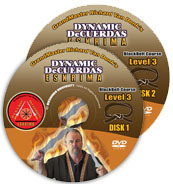 Dynamic DeCuerdas Eskrima is one of the deadliest close-in blade fighting systems in the world. The true system was kept secret and handed down family to family. The late Grandmaster Tenio openly taught a mixture of 19 Eskrima systems while keeping the core of the teachings secret. Master Tenio passed down the true teachings to Master Richard Van Donk who is now revealing the art of DeCuerdas Eskrima in a step by step, level by level teaching format that is done both in a direct how-to instruction and also shown in a dojo setting. These teachings are now available as an Eskrima Home Study Course which encompasses Levels 1-4 of the 7 levels of our art. Very hard work and an in-depth study of the material in this distant learning course will take you to Level 4 BlackBelt (this test will be in person). Normally in the past until about 1984 the FMA (Filipino Martial Arts Association) did not give belt style rankings as they do in other Asian martial arts and only titles given by your master signified your ability to others in the family. GrandMaster Tenio broke that tradition when he gave Richard Van Donk his black belt in 1984. 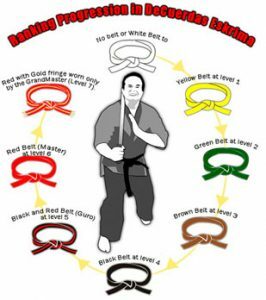 So Richard has decided to continue what his teacher did with him and use a belt system of ranking. 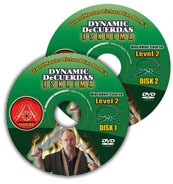 But this Dynamic DeCuerdas Course does something more than give you a grade. It gets you centered in your body. It gets you grounded. It teaches you to be patient. It teaches you to quickly counter. It teaches you speed of attack and defense. It teaches you how to be more efficient – that less is more. It teaches you confidence beyond a punching, kicking or grappling style – Why? Because when you can get comfortable with flying stick and knife attacks coming at you from all angles then a punch seems like nothing. It teaches you self worth and to have less fear. Knowing that I can defend myself and family is priceless. You can earn your Black Belt too with this step-by-step training course. Ranks are realistic and are very hard earned. They are not guaranteed. We are about learning the art and not about grades even though we award them and congratulate those that earn them. You get about 4 years of study material for less than $6 a month average. And, If you do know how to handle and defend against sticks and knife attacks, you have an ace in the hole. And having an Ace in the hole is a great feeling, isn’t it? for Only $379 . Only $297. 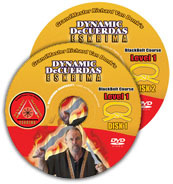 DISK 1 – Intro to Eskrima, Weapons we train with explained, Energizing warms ups, Ready, Attention, Fighting and Salute Positions, How to hold the weapons, Secondary defenses, Twirling the stick, Striking and Cutting styles and Basic Strikes #1-5. DISK 2 – 9 Angles of Attack, 5 Distances, House Blocking System and drills, Punching Styles, Passing, V-Movement Patterns and in class teachings. Philosophy. DISK 1– Serrada stick strikes #6-#12, Long arc strikes, Using Arko(twirl of the stick, Abanico strikes #1-3,Single stick versus single stick inside & outside basics, Single stick #1-12 freestyle alternating strikes and blocking, Body Strikes-Palms. Disk 1 – Falling Skills, Basics Forward and Backwards, DeCuerdas joint locking – Basics, DeCuerdas Basic Throwing and Takedowns, Basic Grappling, Flow Touch Return – Checking, Stopping Strikes 1-9, Double Stick Blocking System, Double Stick 1-5 DeCuerdas Striking. with Grandmaster Gilbert Tenio and Master Richard Van Donk. 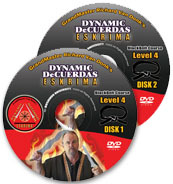 De Cuerdas is one of the deadliest close- in blade fighting systems in the world. Striking, blocking, and cutting systems are covered in detail with one & two sticks (blade). Learn to disarm knife attacks and handle multiple attackers. The true system was kept secret and handed down family to family. 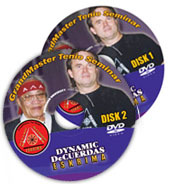 This is the only video of the late Grandmaster Tenio teaching De Cuerdas Eskrima available anywhere. Filmed at a live seminar taught by Grandmaster Gilbert Tenio and Master Richard Van Donk. The late Grandmaster Tenio studied martial arts for 69 years under 19 different Eskrima masters. He was a teacher to Bruce Lee, Chuck Norris, Danny Inosanto, Wally Jay, Master Van Donk and many more. program. We are thinking about using Skype for private lessons and testing. This is all included in your $379- (Special Only $297- ) investment. If a young couple in Finland can do it then you can do it. Sign up now while it is on your mind. I have trained in many arts and this one is my ace in the hole.